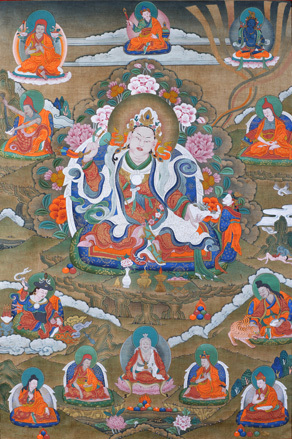 Guru Loden Choksé (Skt. Mativat Vararuci; Tib. གུ་རུ་བློ་ལྡན་མཆོག་སྲེད་, Wyl. gu ru blo ldan mchog sred; Eng. 'Wise Seeker of the Sublime') — one of the Eight Manifestations of Guru Rinpoche. Guru Rinpoche would master a teaching the first time he encountered it, and experienced visions of deities without needing to practise. Attaining the first vidyadhara level, the stage of 'the vidyadhara level of maturation' or 'vidyadhara with karmic residue', he was known as Loden Choksé, 'Wise Seeker of the Sublime'. This page was last edited on 9 July 2016, at 07:36.